Like many of you, I have been glued to the news and am so saddened by all that has been brought on by this latest storm. We have now heard from all of our family & friends who live there, so it is relieving to know they are all fine, but many of the stories of what folks are going through is heartbreaking. But we humans are a resilient lot. I woke to a lovely e-mail from my new friend Elizabeth (who I met in New York last May at the Blogfest on Design) and the subject line was, Resilient in Rye. She and her family live in the lovely New York town of Rye. She wrote of their many blessings and how grateful they are that all is fine. But I also know from all the news how tough it was for them and all the work that will go into the clean-up and rebuilding of things. Natural disasters make all of us really examine things, and makes us so grateful for the ones we love and the things we still have. I find questioning what is important in life part of this process. Times like these make us all so grateful for what we have and any good fortune–Mother Nature is very complex. At a time like this, soup can be so comforting. 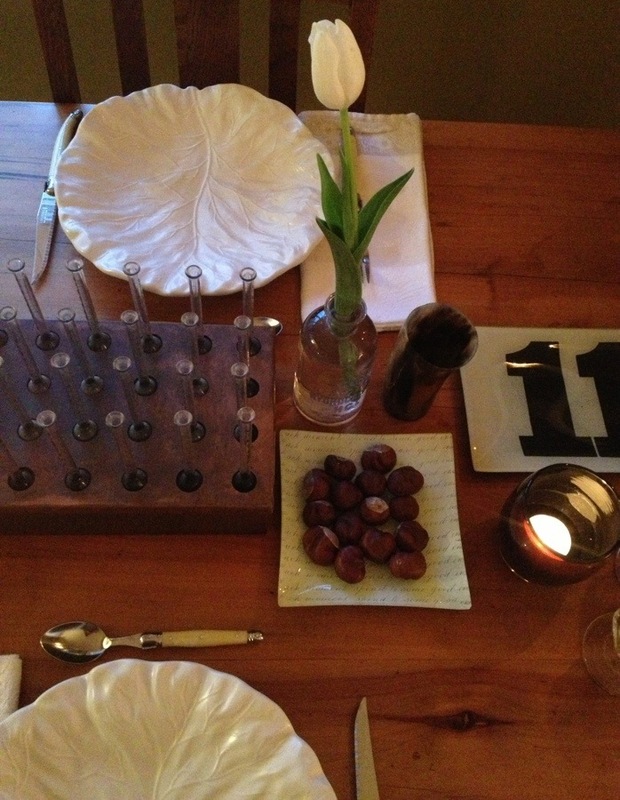 We made stock the other week-end out at our place on Vashon Island. 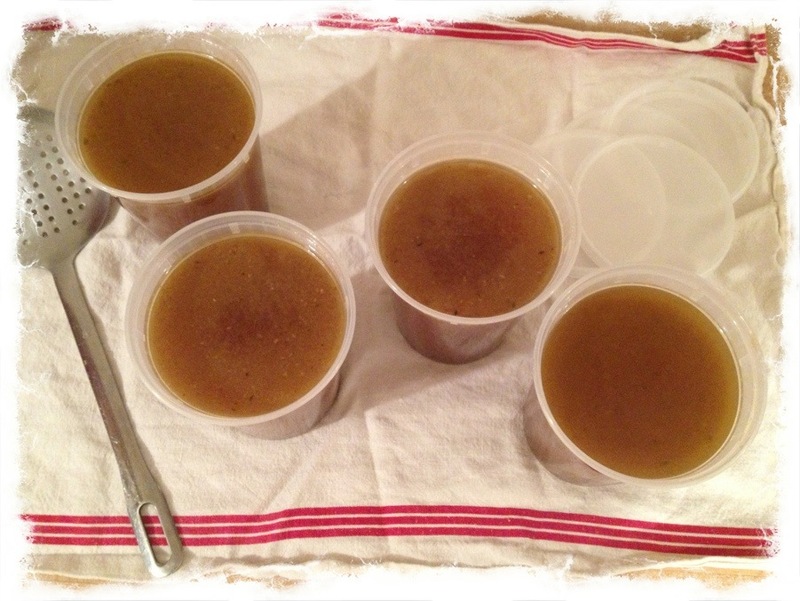 Here is our quick & easy stock recipe. Since we frequent the organic farm stands all through the Summer, we collect every bit of produce that we don’t use in a recipe. We add all the onion tops & skins, spiny greens, carrot tops, herbs–to a plastic bag and keep it in the freezer. We add to the bag all through the season, many times creating several bags. I also roast many chickens for Sunday night suppers, so we create other bags for all the carcasses and add those to the freezer. Come Autumn, the freezer is brimming with produce and chickens, just ready to be made into stock. Add all to a large stock pot. Cover with water. Add a small handful of peppercorns. Boil all. Then turn down the heat to very low but you are still seeing bubbles coming up. Cover and let cook for several hours. Once done, skim the top layer of foam and any fat that has collected on top. Take out all the solids. Strain your beautimous golden stock. Fill containers. We use plastic soup containers we get from our local Thai restaurant. 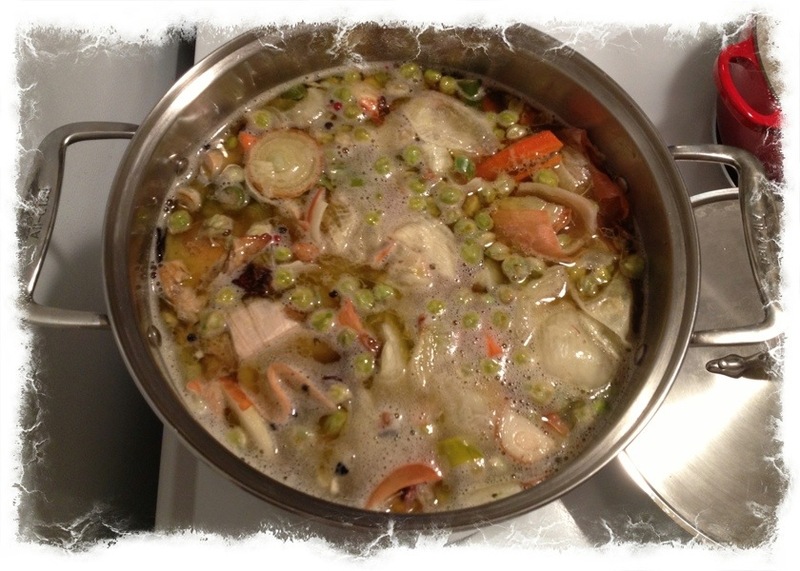 Put in freezer and enjoy all Winter long when you want to make soup or add to recipes when it calls for chicken stock. Your chicken stock. The stock you made yourself. Smile at how cool you are that you have stock sitting in the freezer. 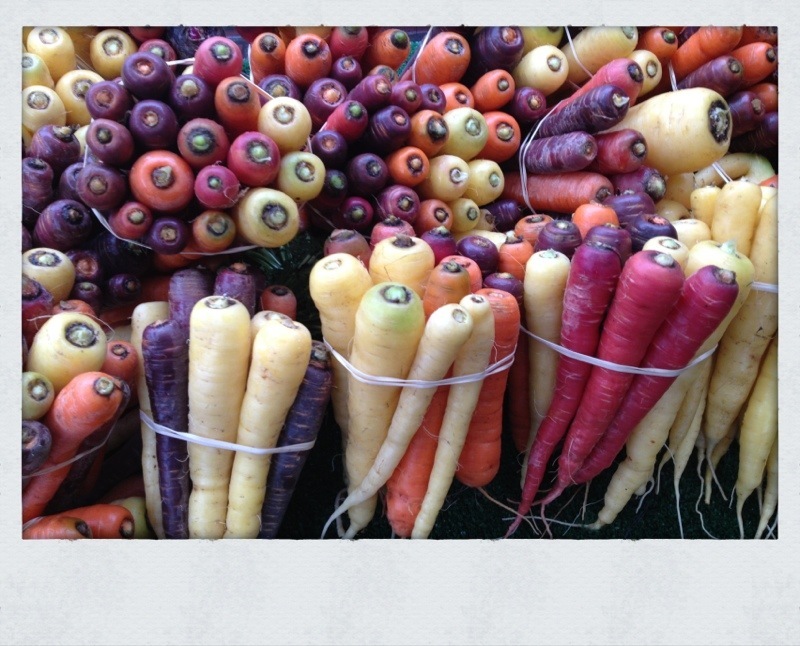 A Market produce vendor had the coolest looking display of gorgeous carrots this Saturday, I just had to snap a few photos. A few bundles of these natural works of art were snapped up too. 2 to give, 1 to roast. I was looking for a veg to roast to go along with a big pot of risotto I was planning to make for dinner Saturday night. These would fit the bill. 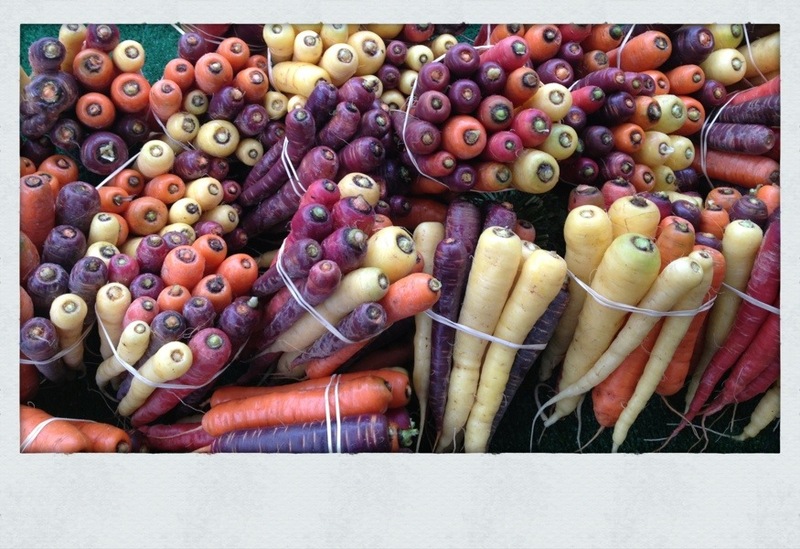 Here is the simplest way to roast whole carrots. 400 degree oven. Peel carrots but leave them whole. Lay them on a baking sheet. Drizzle with olive oil and salt. Mix them around so they are evenly coated. Roast in oven for half an hour, more or less, depending on the girth of the carrots. They will be a bit caramelized and super sweet. So easy. So good. I could not pass up putting a bunch of these in a cello bag for gifts for our friends Peg & Camilla who own the shop fini next to the WK Fine Living shop in the Market. 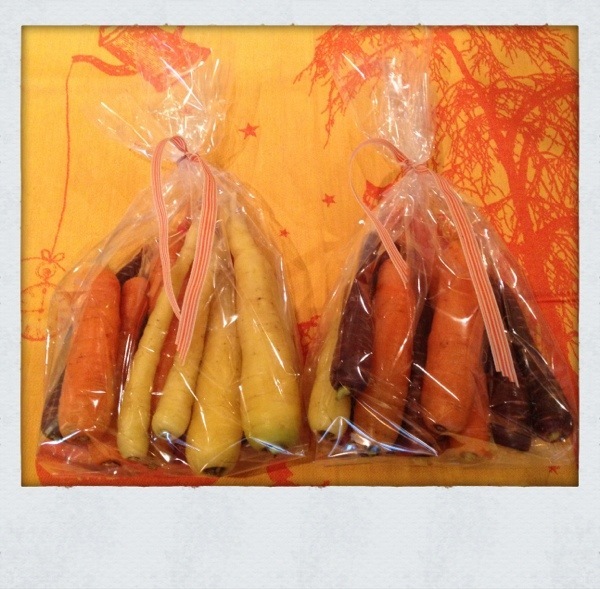 The clear bag just the right wrapping to see the colorful carrots, tied off with an orange striped ribbon. I stopped dead in my tracks when I saw a huge display of tulips for sale at the grocery store the other day. It is not even the end of October and they have arrived. Bless the hothouse growers. It used to be a huge deal to see my beloved tulips in early January, but to be able to mix them on a table with dahlias had me giddy. Call me a flower nerd. These things excite me to no end. 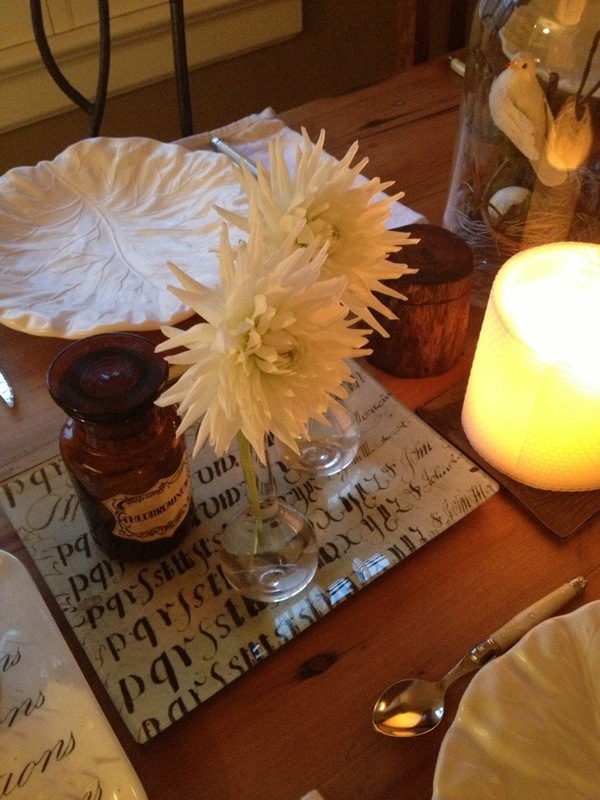 We had guests for dinner on Friday evening, so it gave me a chance to mix the 2 flowers, ever so simply, into a table setting. White was the only color of dahlia I found in the Market, but you know that always works for me. The white tulips working perfectly in vintage bottles. They tied in nicely with the white pumpkins too. 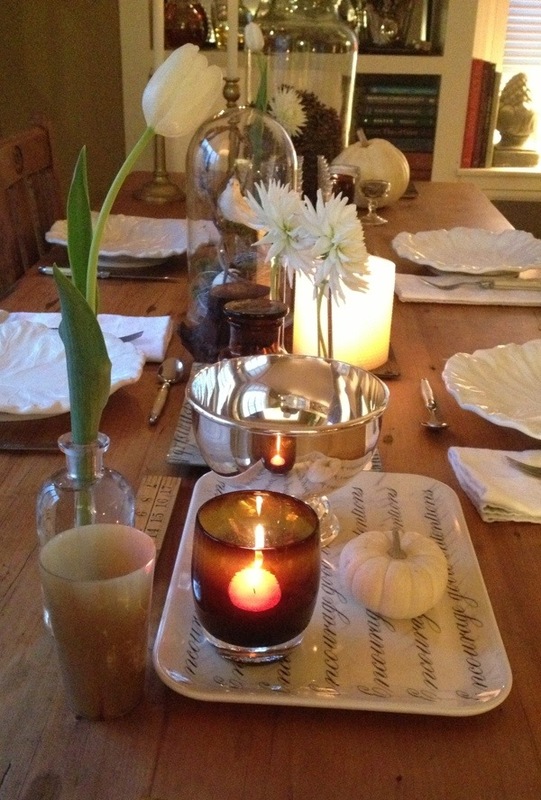 An assortment of trays and other vintage finds would fill up the middle of the table for a little visual interest. 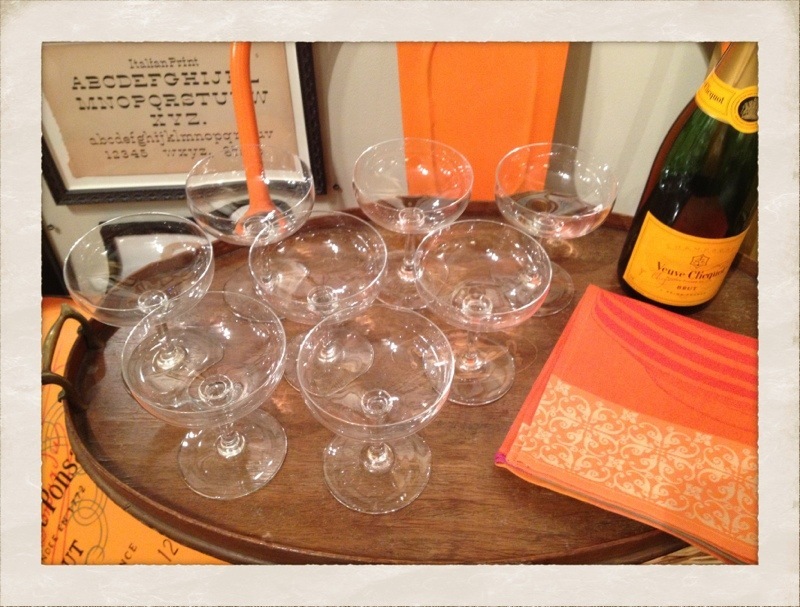 All set with a combo of two different flowers–ready for guests to arrive. Friendships are really one of the greatest pleasures of life. I remember my grandmother saying that if you could count your true friends on both hands that you were lucky and fortunate indeed. Sage words of wisdom for sure. If that good fortune extends to your toes, even better. Tradition feeds into a rich friendship. Yesterday morning was one of those traditions with a group of 3 friends that I hold near & dear, that are counted among my very closest. We meet at the same spot for each of our birthdays for breakfast, always. 4 times a year, like clockwork. Most times even the same table. We started doing this many years back, and it has become such a highlight to our birthday. 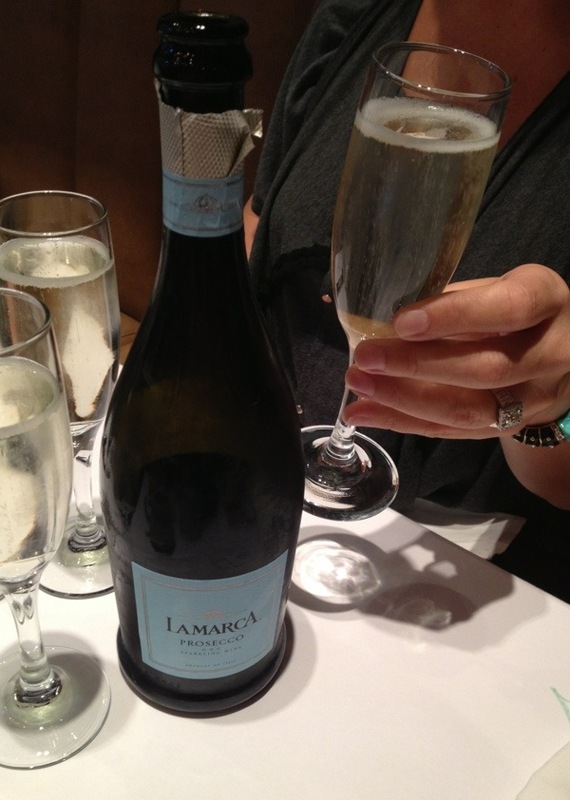 We laugh, we tell stories, we catch up, we eat, we open presents, we drink bubbly, we laugh some more. So good for the soul. 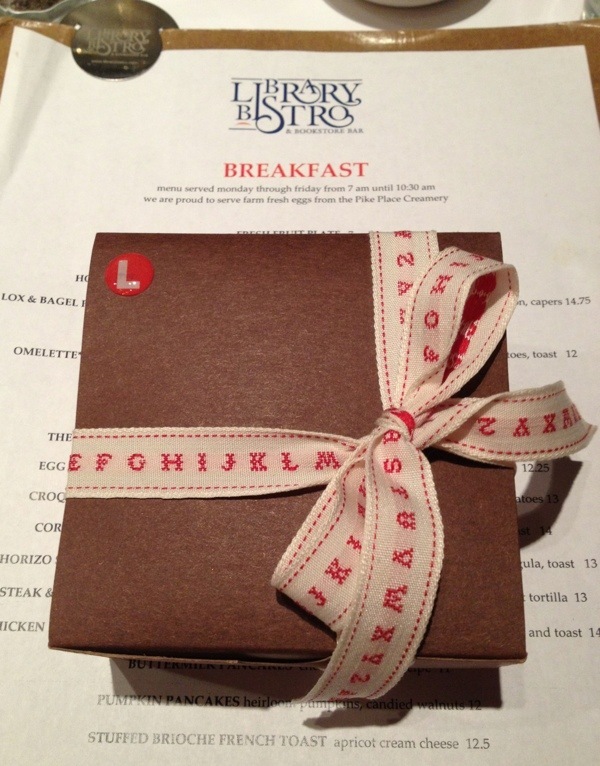 Catherine, Rise’ and Linda–sending much love & gratitude for our lovely tradition. I would love to hear about any traditions you might have with those you hold near and dear. 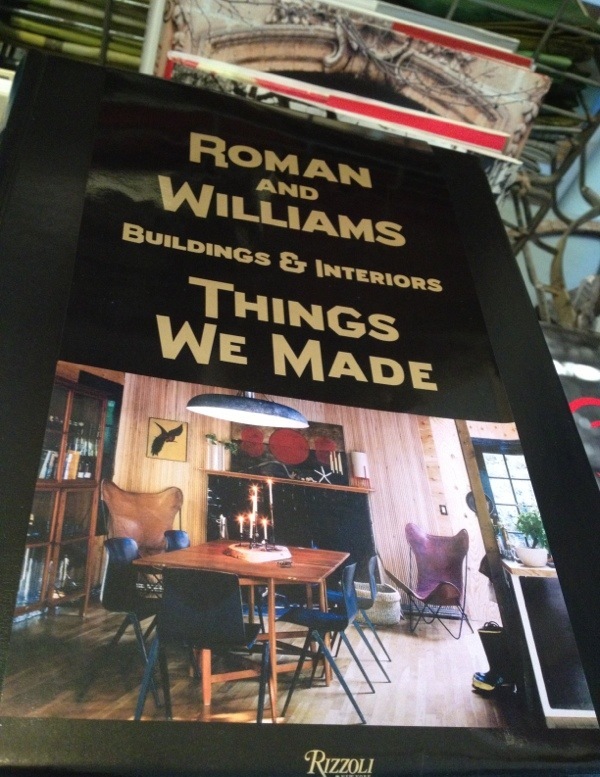 Robin Standefer & Stephen Alesch of Roman and Williams have been the “It” couple of design for the last few years, and deservedly so. With successful projects in New York like The Ace Hotel, The Dutch and 211 Elizabeth Street, to name a few–be it home, hotel or dining establishment–they have left their distinctive mark dotting the city. I have loved their very lived-in, slightly tarnished, highly visual aesthetic since their projects started popping up in design magazines and about the city. There is such attention to detail. Their new book, “Things We Made” arrived the other day at the shop. Just like a Roman and Williams project, the quite hefty coffee table sized book did not disappoint. It is filled with page after page of stylishly photographed projects. Of course, their home in the city and in Montauk were my favorite. I always love seeing the inside of creative folks’ homes, as they are filled with ideas and inspiration. 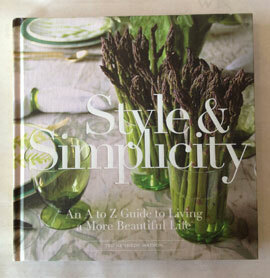 This is a very cool book to add to your collection or for the design enthusiast in your life. 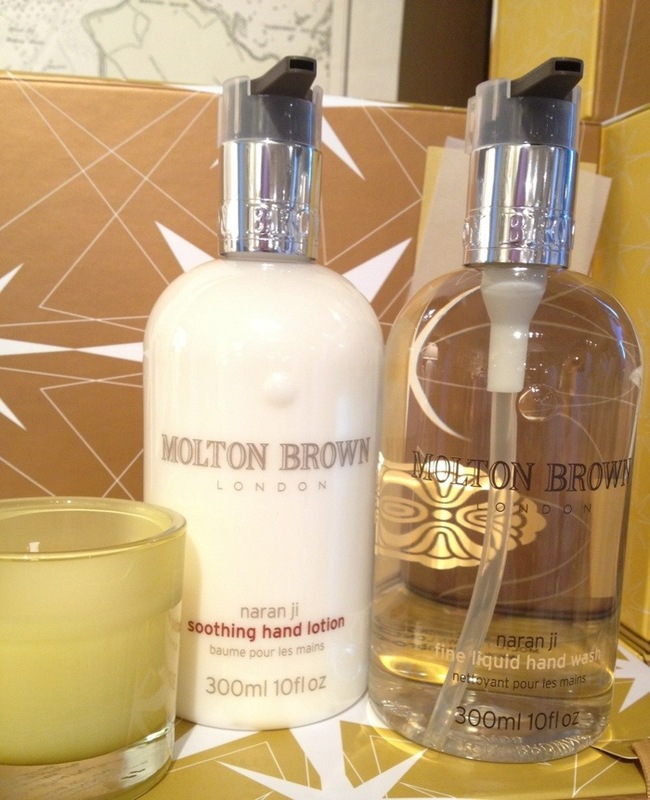 Molton Brown from London is one of those companies that has gained cult status. The best-selling scent, Naran Ji, falls into the ‘classic’ category for many fans around the globe. 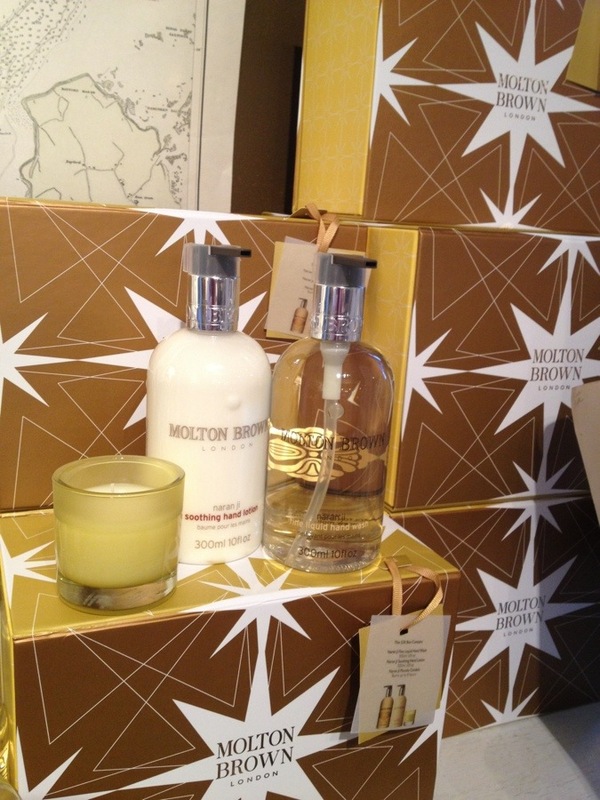 Molton Brown is a line we have carried at Watson Kennedy almost since we opened the First & Spring location 10+ years ago. I had been a big fan, and was buying it at Heathrow upon returning from London excursions. The Naran Ji scent being used by British Airways was always a reminder that I needed to stock up. 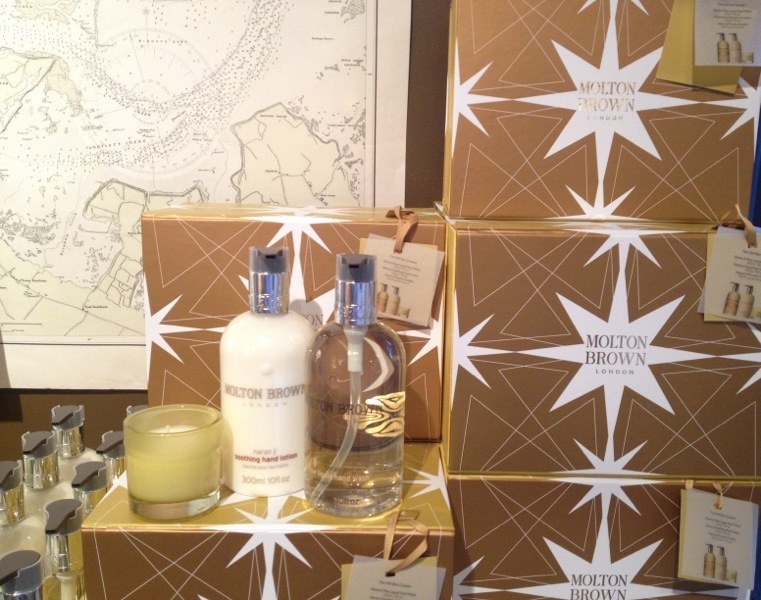 I am not the biggest fan of gift sets, as I think our customers prefer to mix & match goods to create a more one-of-a-kind gift. 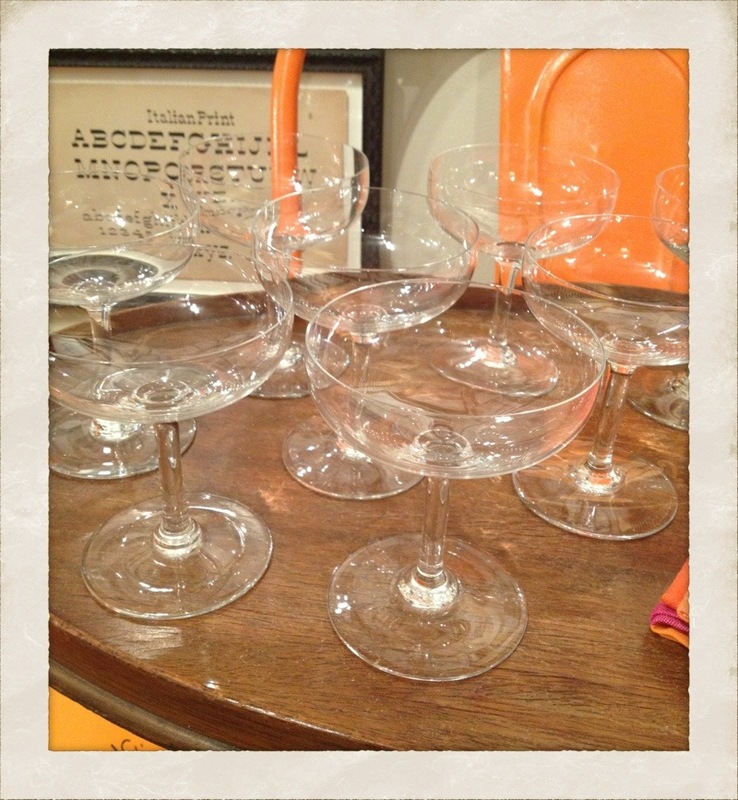 But I just could not pass up this set as it was so good! Beautifully boxed, with a liquid hand soap, hand lotion, and a mini travel candle–all in the classic (neroli, grapefruit extract, and orange oil scented) Naran Ji. 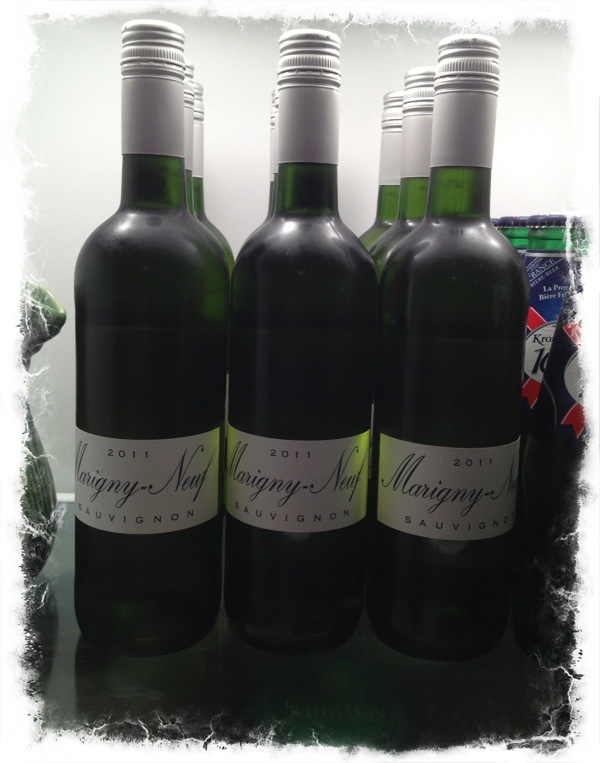 When I find a good wine, I love sharing it. That is why Wine Wednesday has been a fun addition for me to the blog posts. One of my favorite spots to buy new wines is at one of my favorite shops in the Market, Pear. They recently added a new wine buyer, and she has added some real winners to the already stellar selection. 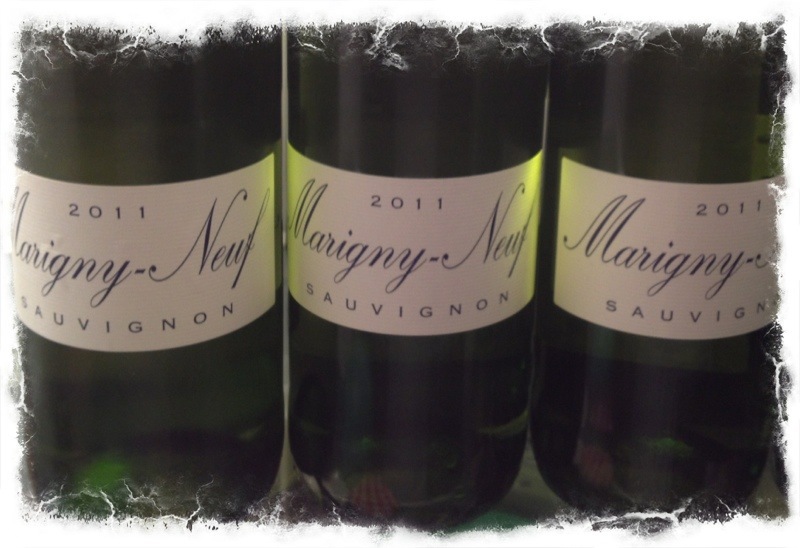 This Sauvignon Blanc from the Poitiers region in France, by Marigny-Neuf, is one very drinkable white wine. Priced to serve at a party or a large dinner, but also special enough to have with a very special meal. You know I like that combination. We recently bought a case and stocked the Sub-Zero, ready for our next gathering–big or small. Seattle preserve creator extraordinaire, Deluxe Foods, is at it again. We just received a new delivery at Watson Kennedy and I am just blown away by the quality & creativity. Following classic French recipes, they add herbs, liquors and clever fruit combinations to make handmade small batch preserves. 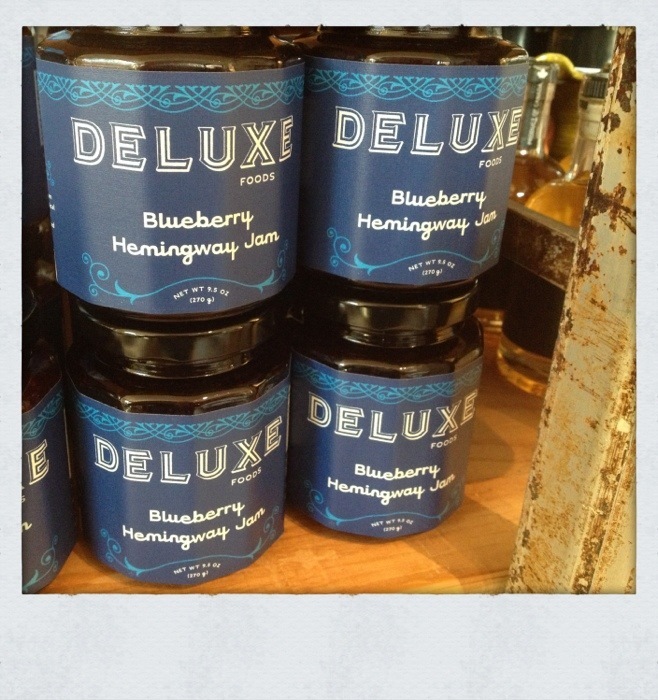 My newest favorite, Blueberry Hemingway Jam, uses lime and rum for a kicky punch. Fab on toast, but equally tasty with cheese. 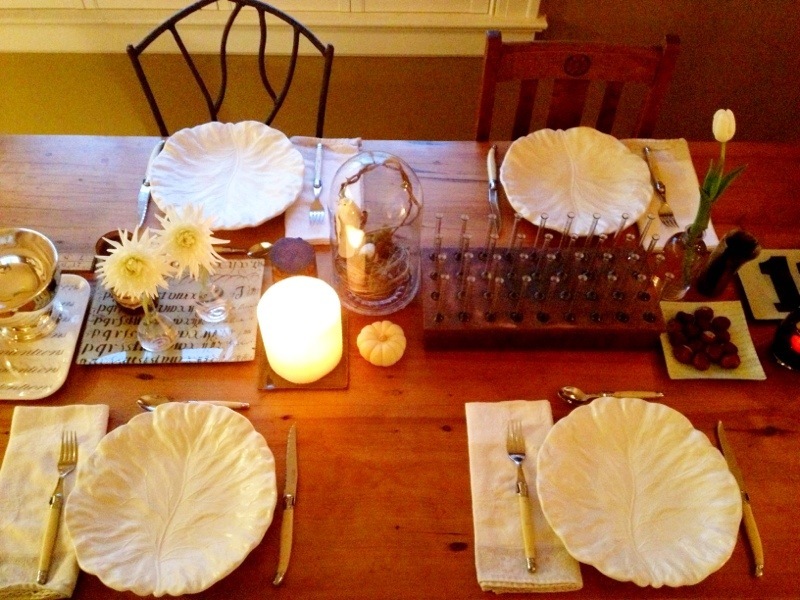 The dinner party we attended the other evening was in honor of Mister Sive’s 50th birthday. Friends have feted him with a host of activities since his big day in May. It has been a fun way to stretch out the milestone birthday. 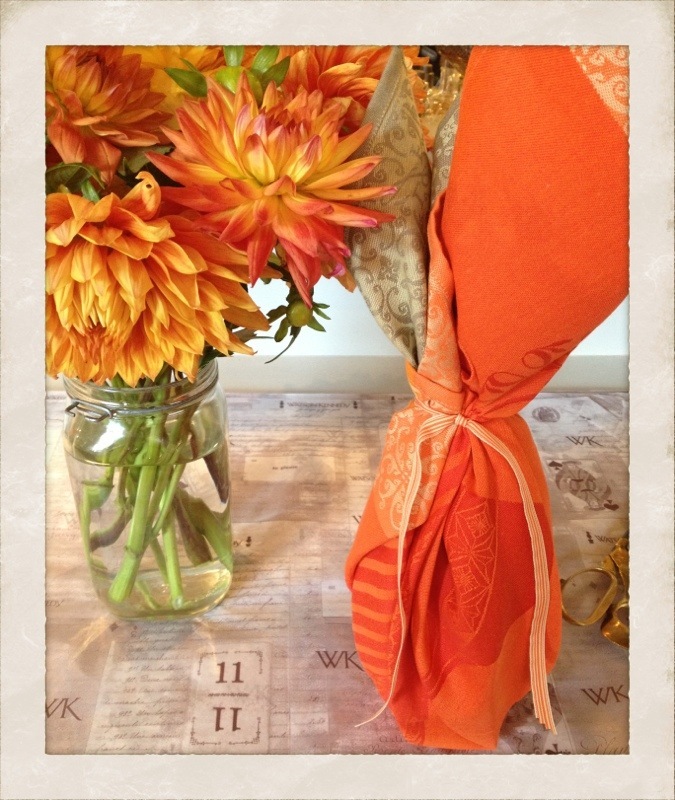 For this gathering, I knew the hostess was a lover of oranges & reds, so once I saw those still glorious dahlias I thought they could become part of the gift. A French towel is always a fun holder, and I tried to match up the color with the flowers. 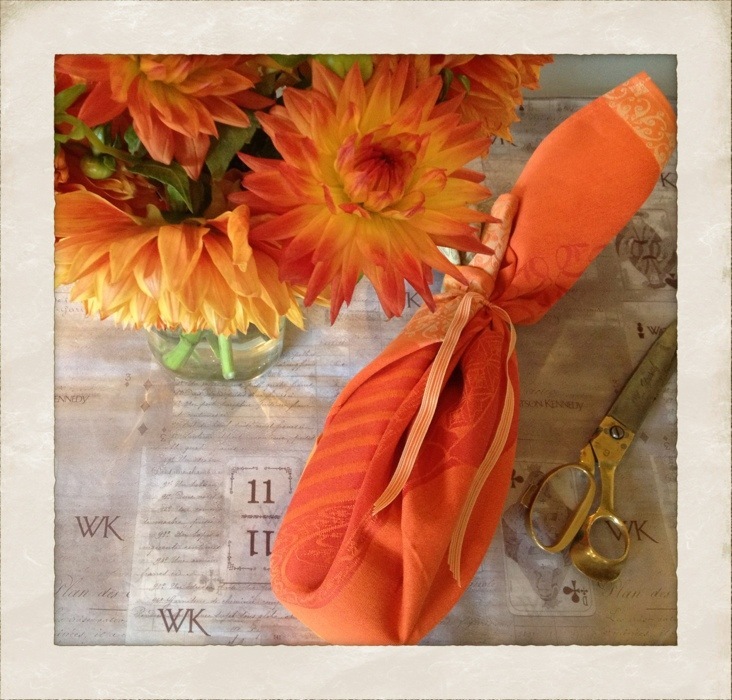 My thought with dish towels is that they are pretty and usable–my favorite combo. Utilitarian with style. Instead of wine, I like to include a good bottle of extra virgin olive oil. For the same price as a bottle of nice wine, the oil will be enjoyed while cooking and be long remembered. A bottle of liquid hand or dish soap is also a fun addition wrapped up in the towel. A color complimentary ribbon to tie it all together, and we were all set.